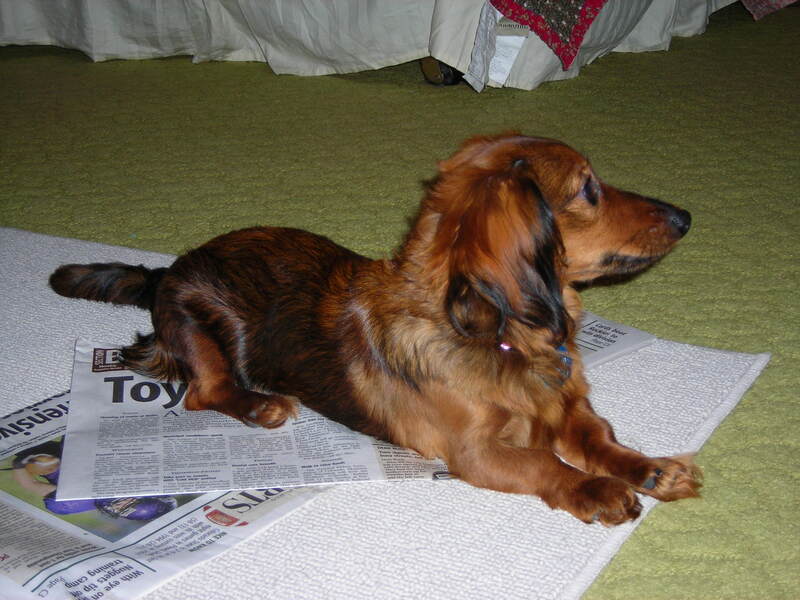 Zoey the dachshund poses for a photo shoot as she relaxes atop newspapers. The way I think about my life is in terms of me and what happens around me that I see, smell, taste and experience. I’m all about trying to make sure my needs are met. I’m a dog, so I’m supposed to be self-centered, or at least to a point. That point is the fact that I’m your best friend. I am your follower as you tell me what you want to do with our day. Go for a walk? Yes! Come outside with me as I bask in the sun? Yes! Pet me and love me and tell me that I am your girl. Of course! I let her know I love her back with morning kisses and cuddling and eager tail wags when we meet up again anytime she heads off to her stupid work. I engage in the second-person point of view when I think about others. I think things like: You need to give me some of your yummy looking dinner. You need to pet me. You need to play with me. Now. And if you don’t, I will bark. And bark again until I get my way. And get noticed. And am acknowledged for my role in our story. So back to me, I am the center of my world, your world and everyone else’ world as I trot along, looking as cute as ever. 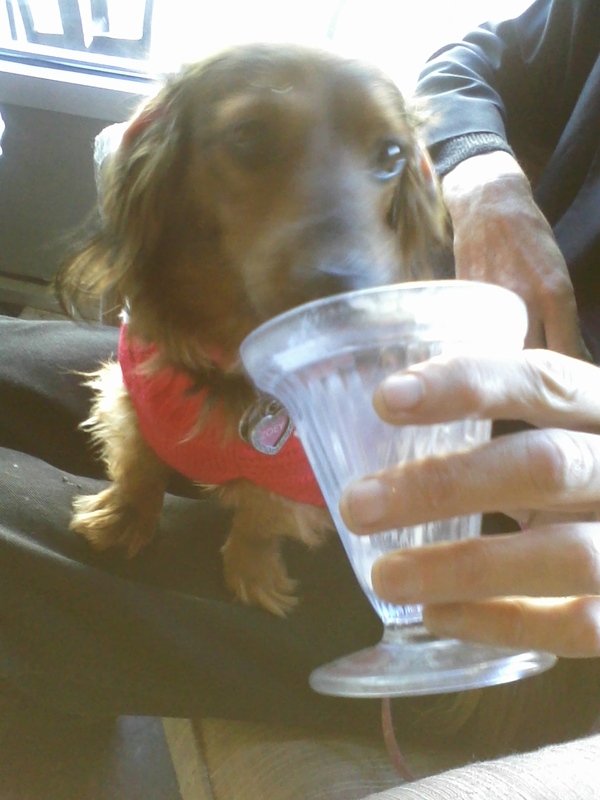 Zoey the dachshund is cute eating ice cream. She believes that she's cute no matter what she does. The theme of my life boils down to one word: me!!! The main message of my story is that I’m cute. The message that people get when they see me out on walks or at PetSmart is that I’m head and nose above the other cute dogs. 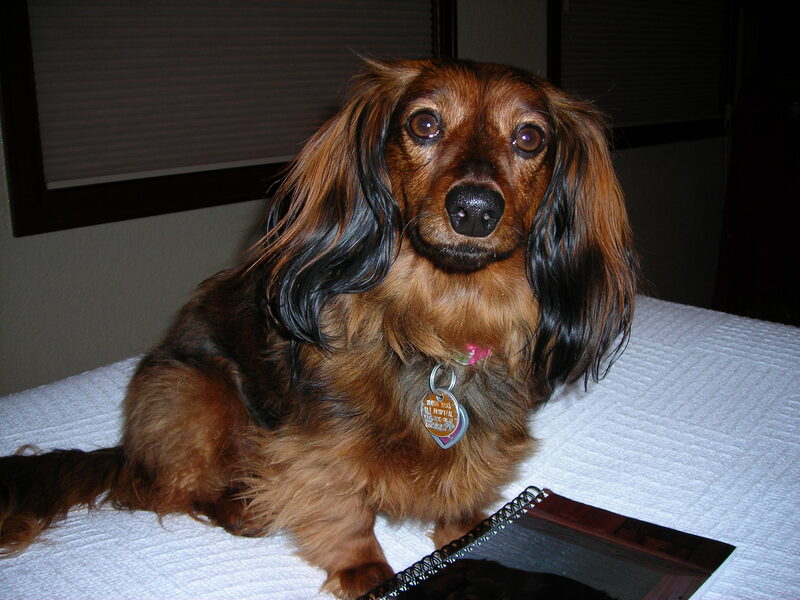 The passersby want to pet me for this reason and probably because my fur – I am a long-haired miniature dachshund – is really soft and quite pretty. In other words, the theme is that I am top dog. Theme, according to books about the writing craft (why aren’t there books about the craft of barking? ), is the deeper layer of meaning that runs through the surface of a story. What I say is the depth comes from the unconditional love that arises between a dog and her owner. The deeper layer is how I can be a good dog even though I want to bark at everything, grab treats when I’m not supposed to and rummage through what’s not mine, I don’t. Well, except for the barking, of course. My breed is known for being barkers. I like to bark at unfamiliar noises, particularly noises that repeat and I find to be annoying (like the dump truck coming down the alley) and bike riders that ride too fast on the sidewalk with their wheels jangling on the cement cracks. The theme of my story is that I’m cute, a fact I communicate through my barking, though there probably isn’t any deeper layer to my yipping and yapping . Except that my bark can be low, growly and rumble with a snarl thrown in if I really get mad at the noises. Oh, I forgot, I’m supposed to be a good girl. 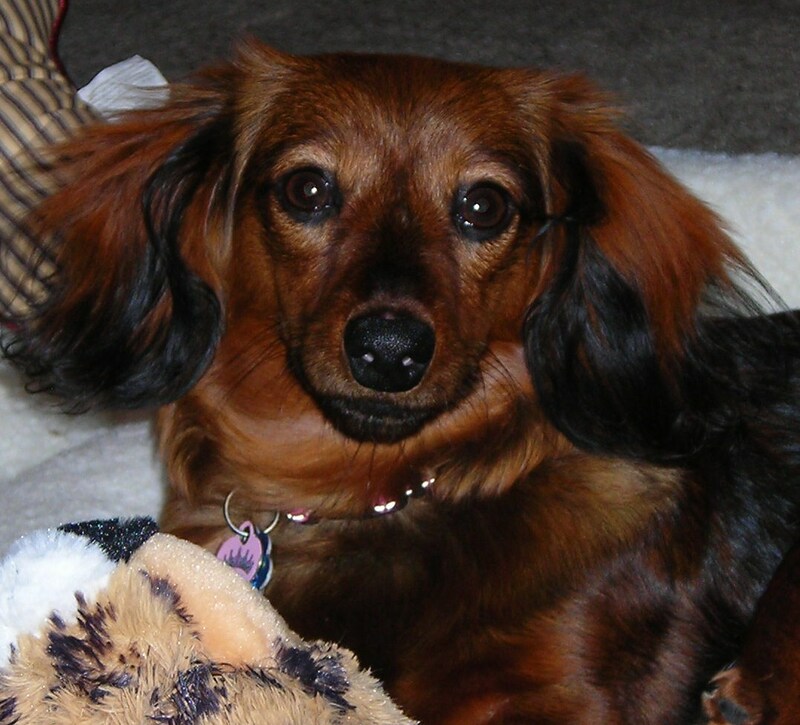 Zoey is the center of her story, a plotting, but cute dachshund. Duh, dogs don’t read. If I were to read, I would read anything with a dog on the cover, a dog character or a dog plotting to get even for not having a major role in great literature. The way I read is I sniff. I can figure out the source of smells – another dog, a dropped scrap of food or food cooking on a grill – by hanging around telephone and light poles, trees or whatnot as if staring at a sunset. I smell this and that, like thinking there is red and yellow coloring the sky. My sense of identifying characters comes from listening to sounds. Is it the neighbor coming upstairs? If I hear the click of her heels, I bark triple time, hoping she’ll come over to play. Or is it the trash trucks coming down the alley? If there are the usual clanks and bangs, I bark extra loud, telling the truck to shut up. If it’s the trains, I don’t say anything. I like the whistles and the rumble of wheels, kind of like a heartbeat broken by a scream. Dialogue is a matter of all the talking I hear around me, interspersed with a bark, a pant or rolling on my back, seeking pets. And happily ever after, because I’m here, the center of my own story. Zoey's next to her journal, the one with her picture on the cover. I am a dog, therefore I do not journal. I do not write. I do not write poetry. I do not say profound things. But I do like to play, to chew, to run around the yard and to bark. * Monday: Go with Shelley, my pet parent, to her mother’s house and run-kiss her mom before sprinting around the back yard, barking loud-loud to let the other dogs know I’m back. I sniff and run and stop for the extra interesting smells. Wait for my special treat when Shelley and her mom go to lunch and coffee. Take a nap. Go home with Shelley. Nap in the car. * Wednesday: Nap while Shelley goes to work. Sit outside when she comes home and engage in some barking, but then I have to go inside. “No bark,” she says. No what? More pouting when Shelley has to go to work again. What is this? I’m a dog, and I need attention. Thursday: Wait for Shelley to come home from work. Grab at her papers to get her to play and squeal in delight when she does. Get out teddy bears for tug-of-war. Friday: More of the same. Come on Shelley, stop going to work. Sunday: Shelley’s mine again. She has a day off. That means playtime.